The Turkey is the symbol of sacrifice. It gives life so others may live. Many holy people and mystics have Turkey as a totem. With a Turkey totem, you have transcended self. You act and react on behalf of others. This act is not a sense of moralism or guilt, but a deep knowledge that all life is sacred. What you do for others, you also do for yourself. To have a Turkey totem is a true gift. Its gift may be spiritual, material or intellectual. Through giving to others will you reach your own goals. The Turkey is linked to the third eye, the seat of feminine energies within us, and the center for higher vision. 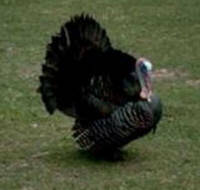 Turkey is also the symbol of the Mother Earth and her abundant harvest. All of Earth’s blessings and the ability to use them to their greatest advantage are part of Turkey’s teachings.